In my previous document concerning decapping, I did not have enough information to make detailed predictions as to how decapping worked in all cases and used the best data I had to develop the rules as I then understood them. The angles given below are the impact obliquities on the plate face of the projectile relative to the normal line projecting at right angles from the center of the initial impact site back toward the projectile, such that 0° obliquity is along that normal line and 90° would be parallel to the surface of the plate at that point. I have no data on yawed projectiles, so I will simply assume that the projectile centerline is aligned with its direction of motion vector at the instant of impact. U.S. Navy World War II nomenclature uses the words "Armor Piercing" (AP) to mean that the base-fuzed, hard-nosed projectile so labeled has a thick, steel AP cap designed to allow intact penetration through some thickness of Class "A" (face-hardened) armor plate. The cap may be soft (all U.S. Navy WWI-era AP projectile designs and most foreign World War I cap designs; no portion of the cap is above 300 Brinell Hardness) or hard (all post-1930 U.S. Navy AP projectile designs and a few World War I and all post-WWI foreign cap designs; the forward face and some depth behind it are well above 300 Brinell hardness level usually 500-625 Brinell, but up to 700 Brinell in some caps - though the portion of the cap touching the projectile nose may be in the soft cap hardness range). Projectiles of similar design, but usually with a larger internal cavity for its explosive charge (since they are not expected to penetrate the thickest or hardest armor) and without an AP cap, are always termed "Common". These projectiles are usually restricted to targets that are assumed to have thinner, homogeneous, ductile armor, similar to U.S. Navy Class "B" armor or "Special Treatment Steel" (STS) plating (ships tended to be armed with projectiles designed to penetrate their own kind of armor, which is sometimes not the kind the enemy uses!). The equivalent U.S. Army terms are "AP" for a projectile specifically to be used against the heaviest armored target but without an AP cap (this obviously is an important difference from U.S. Navy terminology, which throws these projectiles into the "Common" or "Special Common" groups if they do not have an AP cap, no matter how heavily constructed), "APC" for AP projectiles with AP caps (U.S. Navy AP), "APCBC" for AP projectiles with both AP caps and windscreens, which are thin, roughly conical, hollow, false noses used to improve streamlining in many projectiles, originally introduced in naval shells a few years before World War I, (windscreens are also called "windshields" and, many technical documents, "Ballistic Caps") (also falling under the general U.S. Navy term AP), and "SAP" ("Semi-Armor Piercing") for large-cavity, base-fuzed projectiles for use against thinner armor (they can also have the "C" and "BC" suffixes added if they use AP caps or windscreens, respectively) (U.S. Navy "Common" or "Special Common" (see below)). British Navy terminology is somewhat similar to U.S. Army terminology, though the use of a windscreen of some type is usually assumed and thus the "BC" suffix is rarely used, but British Navy terminology also used the term "CP" ("Common, Pointed") in addition to or instead of SAP (with or without the "C" for the AP cap or the "BC" for a windscreen, as needed) for base-fuzed, large-cavity anti-ship projectiles (same as U.S. Navy "Common" or "Special Common" (see below)). British post-WWI CP shells also frequently used hoods (see U.S. "Special Common" (see below)), though they did not use the term "hood" and did not make any special nomenclature to indicate when a hood was used in their Common ammunition (for example, the British World War II 112-pound 6" Common shell used a hood to attach its long windscreen (the only 6" anti-armor shell they ever used after World War I) and it was called CPBC or, later, SAP, with no reference to the method used to attach the windscreen. So British Navy terminology has aspects of both the U.S. Army and Navy terminology used in the 20th Century. U.S. Navy World War II nomenclature uses the words "Special Common" to mean any large-cavity (over 2% filler weight in World War II and over 3.5% filler weight in World War I) base-fuzed Common round with a windscreen that uses either a thin, soft-steel sheath, termed the "hood" (other nations use other names for this device), soldered to its nose for cutting the threads holding the windscreen or a true AP cap, though few U.S. Navy Common (large-cavity) projectiles used an AP cap (the 8" Mark 15 Special Common introduced in 1930 being the only one that I know of). If the base-fuzed Common projectile has no windscreen (only WWI-era shells) or has the threads cut directly into the projectile's hard nose (causes cracks on impact), the term "Special" is not used. Note that several U.S. Navy Common projectiles would be called AP projectiles by foreign nations, since U.S. Navy post-WWI base-fuzed projectiles of any type tended to have rather small cavities to increase their strength and, hence, oblique impact armor penetration ability. The plates used were everything from mild steel through high-tensile steel to homogeneous, ductile naval and tank armors. The striking velocities are all assumed to be over 1200 ft/sec. For large naval projectiles, this velocity is never reached even at maximum range. Smaller guns have more retardation due to air resistance and thus might have the striking velocity fall below this value at near the gun's maximum range, but rarely will the gun fire its anti-ship shells at such ranges at very high elevation angles with long times of flight - due to the poor chance of getting a hit against the smaller, faster, more maneuverable targets these guns are designed to be used against. Tank and anti-tank guns are also fired at very close ranges compared to naval fire and thus never have this occur, either. Only if the shell hit something prior to reaching the target (the ocean for a diving shell or some plating spaced in front of the plate being hit here) would the striking velocity be less and any such previous hit cause other effects, such as setting off the projectile's fuze and so forth, that make this kind of thing unlikely to be of any significance in our discussion. Also, if the shell penetrated the decapping plate at a low velocity, it would not have enough velocity left to penetrate any appreciable thickness of metal behind the decapping plate in the first place, so this condition is again of little significance to us. All AP caps themselves of a given type are assumed to be rather similar in their properties. They are all made of similar materials for a given kind of cap, hard or soft, and react much the same way to plate impacts. While there are differences between projectile designs that have some effect in a given projectile's case, the averages are what I give here. I am not trying to develop a system that is ALWAYS right EVERY SINGLE TIME, which is not possible, but that can give the correct result at least half the time and usually more. Some individual projectiles will not fit the averages given here, but the data given here works most of the time and that is all that I can hope for. The data I used, as can be seen from the above list, is much more than I originally had, but it is still incomplete in that some obliquities of impact (especially under 30° and over 45°) are not represented by very many tests and, while some trends seem to be occurring at over 45°, the data is too small to make any kind of prediction, so I am now assuming that the results for 45° also are true up to 80° obliquity, above which I assume all projectiles will glance off the decapping plate rather than penetrate it. Also, at high obliquity, the projectile is resisted more by trying to cause it to glance off the decapping plate than by trying to slow the projectile down, and in some cases the projectile may penetrate the decapping plate sideways ("base-first" penetration through a long tear made in the plate by the nose as the base slams down on the plate when the nose finally tries to glance off the plate) which will cause the projectile to tumble and yaw considerably after it falls through the plate, usually making any prediction as to the projectile's penetration of any later plates rather difficult to do. That being said, we can now try to make sense of the test results and make some estimates as to what happens to the AP cap or hood when a projectile with one of these penetrates a homogeneous, ductile iron or steel plate. These are caps below 300 Brinell everywhere that deform on impact with any iron or steel plate. Hoods are considered just a form of soft cap, as they are attached much like an AP cap and actually act as one in several ways against an armor plate. These are hard caps (the front portion well over 300 Brinell, as mentioned above) that make up most of the post-WWI AP caps used by most nations. These are hard caps that seem to be identical in every way to those of the Type 1 group, except that they take about double the thickness of plate to knock them off at 30-45° obliquity and about 50-75% more to knock them off at normal and at over 45° obliquity. There may be caps that fall outside of these three groups, but the groups seem to contain all of the AP caps and hoods that I know of. Occasionally, one of the projectiles in one group will have a projectile act as if it was in the other group, but this seems to be rather rare; as I said before, nothing is perfect, so I am trying to provide information on "the way to bet and win" on any given test with one of the projectiles in a given group. What is the difference between these three groups, in detail? 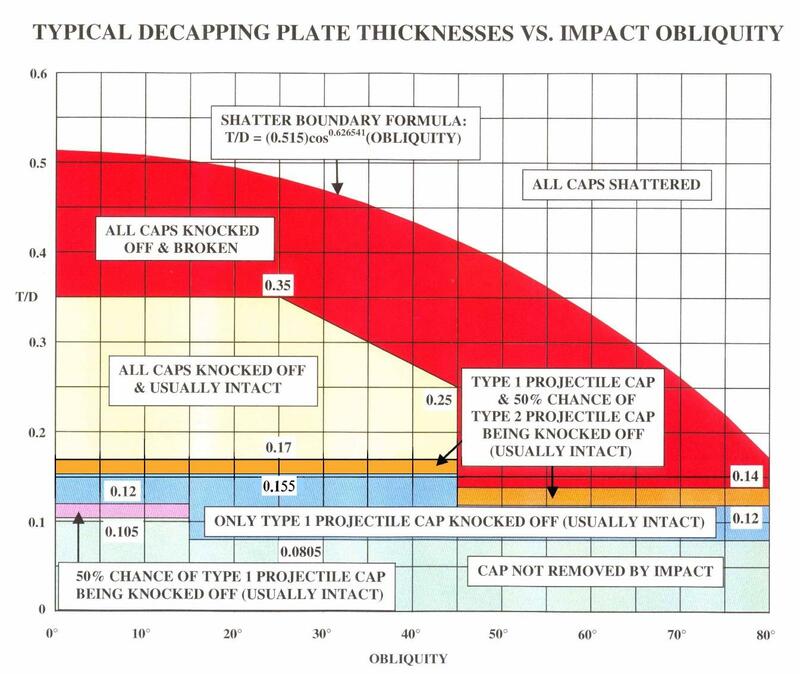 Typical Decapping Plate Thicknesses Vs. Impact Obliquity. If you will look at the Figure, "TYPICAL DECAPPING PLATE THICKNESSES VS. IMPACT OBLIQUITY", you see what happens to the AP cap most of the time for the Type 1 and Type 2 hard capped projectiles. The hood/soft cap group will usually fall under the Type 1 group as to what it takes to knock off the AP cap, with exception that the small step at 15° obliquity (the region with the 0.105-caliber and 0.12-caliber T/D values) is only at 15° half of the time, with the step moving over to 20° obliquity the other half of the time. This is from many tests with hooded projectiles where this 15-20° region was a Zone of Mixed Results, probably because the soft hood/cap is deforming slightly differently from impact to impact and the stress on the hood/cap which peels the hood/cap material from the nose, splitting the solder's grip on the hood/cap, varies with this difference. Thus the soft cap or hood is actually slightly more difficult to tear off than a Type 1 hard cap in this 15-20° region. Also, any time a Type 2 cap is always knocked off (light yellow and red and white upper regions in the graph), the hood or soft cap is flattened out on the plate face and shattered, with little or any of it making it through the decapping plate (the results are always like a hard cap shattering in this case). The details of the shape and method of attachment of the hood or soft cap to the projectile nose or any other projectile properties makes no difference. All Krupp Psgr.m.K. (AP shell with AP cap) designs that have a hard cap, starting with their 1911 28 cm Psgr.m.K. L/3,2 (28.3 cm (11.14") AP shell with AP cap of length 3.2 calibers) and its slightly longer and later World War I "brothers", the 30.5 cm and 38 cm Psgr.m.K. L/3,4 (12" and 14.96" AP shells with AP caps of length 3.4 calibers). All earlier Krupp projectiles with AP caps had soft caps. This includes both World War I and World War II Krupp Navy and World War II Krupp Army APC projectiles, which resemble each other in many ways very closely. The U.S. Navy 3" AP Mark 29 and Mark 30 projectiles were very similar in design, differing only in the use of a U.S. Army M66 BDF in the Mark 30, probably for use in their 3" anti-tank gun, which later was also added to the Mark 29 shells used by the Navy (for shooting at surfaced submarines, primarily, which had rather strong armor-grade steel in their hulls and, in some cases, armored conning towers). Originally, the Mark 29 had only an inert filler and no fuze. No AP projectile (small filler cavity with an AP cap) of this size had ever been made for the U.S. Navy before and they did not have their own base fuzes. The U.S. Army 76.2-mm (3") M62 APC projectile used in its anti-tank guns and in the medium-length 76.2-mm gun that replaced the short 75-mm gun in the later M4 Sherman tanks. While it is possible that some other projectiles, especially World War II U.S. Army APC projectiles, also fall into the Type 2 category, I do not have any data, except that the 37-mm M49 and M51 APC projectiles and the 75-mm M61 APC projectiles are most definitely Type 1 designs. What is the difference between the Type 1 and Type 2 APC projectiles? Virtually all U.S. Army World War II AP caps look about the same and were made of similar materials, while a number of British shells, which are all Type 1 designs, had AP caps ("knob-and-ring" design) that matched Krupp standard post-WWI AP caps in design almost exactly, yet the latter are all Type 2 designs. Some of these projectiles have very blunt oval noses, others have long oval noses with blunt tips (either pointed or rounded), while others have blunt points of various lengths. British and German World War II APC projectiles had almost exactly the same nose shape (simple 1.3-1.4-caliber Radius-of-Ogive Tangent Ogive (single arc of circle) nose shapes), but one is Type 1 while the other is Type 2. Also, the 76.2-mm M62 APC is Type 2 and the 75-mm M61 APC is Type 1, though both are very similar in nose shape (blunt-point Secant Ogive design) and cap design, which shows this again. British and German AP caps were soft near the surface of the nose under them, but quite hard in their forward face for a considerable depth. This design varied depending on the date made, the projectile size, and the manufacturer. U.S. Army caps were hard all the way through, while U.S. Navy caps were about the softest of the hard caps, mostly only 555-583 Brinell maximum hardness at the face and similar in hardness to British and German projectiles lower down the "skirt" of the cap that surrounds the projectile nose itself, with the exception of the 3" Mark 29 AP, which had a very hard Army-style-hardness-pattern AP cap, and the last versions of the 6" Mark 35 and 8" Mark 21, which had super-hard AP caps of 650-680 Brinell all the way through (not included in this decapping test, though). The 37-mm M49 had some projectiles of an experimental version made with reduced AP cap hardness, though still in the hard-cap range, and this did not change the test results at all. 37-mm projectiles were fired with and without their windscreens and no difference was found. Windscreens varied considerably in length and material made from and did not seem to have any effect either way. Some 37-mm M51 APC projectiles had their AP caps removed, the noses and cap bases honed to a precision fit, and then carefully soldered on again, ensuring a maximum-strength solder bond. There was no effect on the decapping results. Small and large projectiles seem to act the same if they are scale models of one-another, as German and British Service APC projectiles and small-scale test models of them showed. Many methods of holding on the AP cap were used from time to time. Many used just solder, others used crimping of the cap into grooves or ridges formed into the nose, while others used locking rods or rings to lock the cap to the projectile nose. The U.S. and British Navies used both soldering and crimping of the lower portion of the AP cap into shallow pits ringing the nose for all of their AP caps in projectiles 6" and larger (and in small-scale-model experimental shells), giving a double bonding method, yet they were all Type 1 shells. Most of these shells used a low-melting-point, medium-strength solder that did not require heating the nose of the projectile very much or very long, so as to prevent the soldering process from altering the metallurgical properties of the shells' high-hardness, tempered-steel noses. The only Type 1 shells modified and tested that matched the Type 2 designs were a few 6" Mark 35 Mod 5 AP shells that had a ring of set screws drilled through the lower edge of their AP caps and into their hard noses. These projectiles acted exactly like Type 2 APC shells when tested for decapping at 30° obliquity, though armor-penetration tests with larger 14" AP shells that had similar screwed-on and soldered AP caps showed that their noses broke more easily when they hit heavy armor, so this practice was not adopted. When using the Figure, take the thickness of the decapping plate and divide it by the nominal bore diameter of the gun (if a sub-caliber projectile, use its actual diameter) to get the thickness of the plate in calibers (T/D), then round down this value to the nearest 0.005-caliber. If the result is exactly on a boundary thickness in the Figure, use the results above the boundary. Also, if the obliquity value falls exactly on a vertical boundary, use the results to the RIGHT of the boundary (the higher obliquity results). Remember, the soft cap/hood vertical boundary shown for Type 1 hard-capped projectiles at 15° in the Figure is 50% of the time at 20° instead (flip a coin each time you have to use this particular region in a test to see which obliquity to use as the boundary). Use a similar coin flip in those three horizontal zones (one purple and two orange) to determine what happens if you fall inside them or on their lower edges, if they apply to your particular projectile (for the purple zone with a hood/soft cap, you will have to flip the coin twice if the obliquity is between 15° and 19.99° and the plate thickness is between 0.105 caliber and 0.1199 caliber). Nothing as far as the AP cap is concerned. Just the windscreen, if any, is knocked off and the projectile slowed down and deflected somewhat. (2) The AP cap can be snapped off with no damage to it. Otherwise, as in (1), above. The AP cap can be snapped off and break up as it passes through the plate with the projectile. Some added loss in velocity may occur as the projectile tears through the plate with the broken cap on its nose. Otherwise, as in (1), above. The AP cap can be shattered on the face of the decapping plate and little of it pass through the plate along with the projectile. In this case the AP cap acts much like a shattered projectile nose and causes a similar, though usually somewhat less, loss in projectile penetration ability at normal and a much larger loss in velocity as the projectile passes through the plate. As obliquity increases, however, the penalty due to the cap shatter decreases, just as with true projectile nose shatter, since the shattered cap impedes ricochet. If the cap remains intact after being knocked off, there is a minimum distance, the "Decapping Gap", behind the plate that the next plate in line must be located at to get the effect on that plate of a completely decapped projectile. If the plates are too close together, the cap does not have time to free itself from the nose and some, if not all, of the benefit of knocking off the AP cap is not obtained. For soft caps and hoods, the Decapping Gap is essentially zero as far as the cap is concerned, as any kind of air gap, no matter how narrow, prevents the impact shock from being transmitted from the nose into the cap and the nose will shatter if it hits a face-hardened plate behind the decapping plate. However, if the plates are too close together, under about half of a caliber, then the decapping plate itself can act like an AP cap as it wraps around the nose and gets trapped between the projectile nose and the plate behind the decapping plate. Thus, a minimum of a half-caliber is needed with soft caps and hoods to ensure that decapping works properly. For hard caps, if the cap remains intact, German 38 cm Psgr.m.K. L/4,4 decapping setup has a 100-mm (0.263-caliber) Wh armor decapping plate spaced 1.6 calibers (the Decapping Gap) in front of a KC n/A face-hardened main armor plate. Since this is supposed to work at all obliquities, I assume this means that a 1.6-caliber Decapping Gap is considered enough at normal obliquity even with intact AP cap. U.S. hard AP caps Army or Navy - do not consistently break up at 0-30° obliquity until 0.35-caliber of STS (armor-grade) is used as the decapping plate and I do not think German Krupp AP caps would be any weaker, so I am assuming that this Decapping Gap was found to be sufficient for intact caps at normal obliquity. Perhaps a larger distance would be needed with a thinner decapping plate, but I do not see how that would make a lot of difference. U.S. Army tests with U.S. APC projectiles and the Japanese 47-mm APC projectile used 3 calibers as their Decapping Gap (roughly one projectile length without its AP cap and windscreen), so I am going to assume that this is the maximum gap needed at normal obliquity as a worse case with the minimum decapping plate thickness. Therefore, the minimum required Decapping Gap would decrease linearly from 3 calibers at the minimum possible normal-obliquity decapping plate thickness (0.105 caliber) to 1.6 calibers minimum for a 0.26-caliber decapping plate or more. I am assuming that once an AP cap is knocked off, it acts like any other AP cap that is knocked off by a plate of that thickness, by which I means that the elastic response of the projectile body and cap is the same for both Type 1 and Type 2 projectiles and the energy absorbed by the solder is roughly the same in either case, so if the AP cap snaps off the nose it will act the same whether it is a Type 1 or Type 2 cap, the only difference being that below the Type 2 threshold decapping plate thickness, the AP cap simply does not come off the nose. For obliquities other than normal, the Decapping Gap for an intact AP cap for both Type 1 and Type 2 AP caps decreases linearly from whatever it is for the decapping plate thickness in use at normal obliquity to a constant 1 caliber at 30° and up obliquity for all decapping plate thicknesses. This gap seems enough for British APC projectiles, since a smaller gap did not work with British 14" and 15" APC projectile tests at 30°, but a very slightly larger gap always worked with British 9.2" APC projectiles. It is possible that the Decapping Gap might decrease at higher obliquities, but I have no data, so I am using this value only for now. If the AP cap breaks up or shatters, consider the case to be the same as the soft AP cap and set the minimum Decapping Gap at 0.5-calibers. Tests have shown that even when the entire projectile breaks up on penetrating a plate, even a 1-caliber gap between the two spaced plates is enough to cause the projectile to act as if it were broken up at any larger distance, so with just the AP cap being broken, which is really just a false nose, I would assume that the pieces would be pushed aside by the still-intact projectile nose behind them rather rapidly (the pieces would tend to be slowed down as they passed through the decapping plate much more than the much heavier projectile would be). This minimum Decapping Gap also covers the case where the decapping plate itself is bent back and might touch the second plate, acting as a surrogate soft AP cap. where "X" is the thickness of the decapping plate in calibers (as rounded down). Note that this DGN value is limited to 3 maximum if it goes over 3 calibers and to 1.6 minimum if it goes under 1.6 calibers. where DG is automatically set to 1 caliber if Obliquity Angle OB is over 30°. If the main plate behind the decapping plate is not parallel to the decapping plate, then this minimum DG value is assumed to be measured along the normal line projecting up from the main plate that goes through the center of the initial impact site on the decapping plate. This is an educated guess from no real data on this part of the DG calculation. The plate thicknesses assume any kind of ductile steel or even wrought iron. There doesn't seem to be any kind of visible trend as to stronger decapping plates being able to be thinner. The projectile nose and AP cap are compressed on impact with the decapping plate and, in oblique impact, elastically deformed sideways and if the solder (or other method(s) of attachment) breaks its hold on the cap, the nose and cap spring back as they exit the decapping plate's back, hurling the cap or its pieces away at a low velocity, causing it to wobble at oblique impact. If a hard cap is intact, the minimum Decapping Gap values are merely those where the cap is thrown so far away by the time the cap and projectile reach the main plate that the cap will virtually never reseat itself properly as it is stopped and the projectile nose catches up to it, preventing the cap from functioning properly (the many British 9.2" APC tests showed that even a small gap of 1 caliber can ALWAYS prevent the cap from functioning after decapping using any plate thickness at 30° and up, while the Krupp 38 cm decapping design and U.S. Army decapping tests indicate that the additional distance even when the impact is exactly symmetrical is not too much longer, since I assume that the solder would break irregularly and cause the cap to wobble or even tumble as it is knocked off the projectile's nose even in this case). Krupp also found that by filling the gap with cement they could cut the Decapping Gap roughly in half, though the heavy cement kind of defeated the whole purpose of trying to use a decapping plate to make their belt armor stronger for a given weight of material (why no just make the main plate thicker and have done with it?). The 0.0805-caliber figure, used in my previous article for all obliquities and most capped projectiles, comes from the data on tests of 6" Mk 35 AP projectiles and the 75-mm M61 and 37-mm M49 and M51 APC projectile tests, which found that 0.25" (0.085 caliber) and 0.125" (0.086 caliber), respectively, of mild steel would always decap those projectiles at 30-45°. These thicknesses were convenient to use and did not precisely define the exact minimum, but they were so close to my 6" Mark 35 results, even though the nose shapes of the projectiles varied considerably from projectile to projectile, that they justify my retention of my 0.0805-caliber figure for that obliquity range with Type 1 projectiles. Most other tests did not find the minimum possible decapping plate thickness, but except for the Type 2 projectiles mentioned above, they ALL were compatible with this result in this obliquity range. For example, the British 40-mm 2-pounder APC projectile tests - which had AP caps, windscreens, and nose shapes identical to virtually all World War II APC projectiles made by Hadfield used by the British Navy from 6" through 15" (not sure about the British 16" APC Mark IB used in NELSON and RODNEY) - used two lots of shells that were supposedly identical, but they were found to be different in the following way: The decapping plates used were mild steel in even millimeter thickness (to my knowledge) and one projectile lot at 30-45° obliquity was found to need a 4-mm plate (0.1 caliber) to decap the projectiles, indicating that the minimum thickness was somewhere between 3-mm (0.075 caliber) and 0.1 caliber, while the second projectile lot at this obliquity range was found to only need 3-mm plates, meaning that the minimum decapping plate thickness was between 2-mm (0.05 caliber) and 0.075-caliber thickness. These results precisely straddle my 0.0805-caliber value, indicating that my result is pretty good as an average value. As these projectiles had quite different cap and projectile nose designs from the U.S. oval-nosed 6" Mark 35, the general accuracy of my original 0.0805-caliber estimate is still correct, though now limited in obliquity range and to only soft-capped/hooded or Type 1 hard-capped projectiles. I am thus justified in sticking with that value. The normal-impact minimum thickness - which I had very little data on previously - was found to be somewhat higher, with the 40-mm tests giving about a 50% increase in the needed plate thickness at normal compared to that needed at 30°. This gives somewhere under 0.125 caliber and over 0.075 caliber, depending on the validity of the 40-mm tests at 30°. Since the Japanese 47-mm APC projectile tests by the U.S. Army showed that a 0.2" (0.108 caliber) mild steel plate would always decap this projectile at normal, I am assuming that is the true minimum possible value for Type 1 projectiles, rounded down to the nearest 0.005 to 0.105 caliber, though the data is fuzzy enough with the British tests to make me increase the minimum to 0.12 caliber as an upper bound for these projectiles at normal and call the 0.105-0.1199-caliber range a Zone of Mixed Results, with a 50/50 chance of decapping if the plate thickness falls inside this internal. Between normal and 30° I have very little data that could be used to find the minimum for Type 1 hard AP caps. However, I had the data on hoods that showed a very sudden change in the forces on the hood (and thus also on a hard cap) when the obliquity exceeded 15° obliquity, causing the hoods to be torn off as they deformed (this also accounts for the failure of soft AP caps in this obliquity range and above against face-hardened armor plates, since they would also be torn partially off on impact and this would nullify their effectiveness as a shock-absorber all around the nose). However, I do not have any information on whether there would be a Zone of Mixed results with a hard cap (the hard front region of the AP cap would be compressed on the impact side as one piece, so it might be less liable to variation in effects), so I am simply ignoring this for now and making the sudden change in decapping force occur at 15° obliquity, with the result that there is a sudden step down to the 0.0805-caliber minimum at this obliquity and greater (14.99° is the maximum for the 0.105-0.1199-caliber Zone of Mixed Results, for example). If I get more detailed information on the region between normal and 30° for Type 1 projectiles, I will revise this estimate, of course. The Type 2 projectiles also have some variation in the minimum thickness to knock off their AP caps at normal and higher obliquity, through 44.99° (45° is the start of the region to the right where breakage occurs), so I am giving them the 50/50-chance range of from 0.155 caliber, found in Krupp German Army APC projectile tests, through 0.1699 caliber (0.17 caliber is the bottom of the always decapped region in the 0-44.99° obliquity range), which seems to be about the minimum needed for reliable decapping in U.S. Navy and U.S. Army tests of Type 2 projectiles. Some U.S. APC projectiles were decapped and some were not at lower plate thicknesses, depending on striking velocity, but there was no trend from projectile type to projectile type, so I am going to ignore these results here as not reliable. The reason that there is no step at 15° obliquity, as for Type 1 projectiles, is that the added thickness seems to compress the cap and projectile nose to a much higher degree even at normal and once the cap solder cracks, the AP cap is shot off the nose like from a loaded spring, so that there is little difference between the sideways twisting forces that allow a thinner plate for a Type 1 projectile and the similar forces that act on a Type 2 projectile as it passes through the thicker plate. The plates needed by the Type 2 projectile are already well over the minimum needed to knock off the cap completely and only the stronger solder is preventing this from happening at any obliquity. At and above 45° obliquity yet another rather sudden change in the forces on the cap occurs. Below 45° the initial forces were all trying to cause the nose to dig into the plate and be deflected to come out the plate back in a direction closer to the normal line; that is, the forces were always in the direction to pivot the projectile to a steeper angle as it goes through the plate. Around 45°, however, the impact forces rather suddenly change to pushing up initially on the impact point of the side of the projectile's nose pressing against the plate so as to pivot the projectile nose away from the plate to eventually glance off. The forward motion of the projectile continues to dig into the plate and whether the projectile penetrates or glances off depends on whether the nose can dig deep enough to have the metal in front of it become thinner in the direction through the plate than the metal which is being mounded up in front of the projectile nose as it acts like a battering ram. If the nose is rotated in the glancing direction fast enough by the pivoting forces under it, it will rotate away from the plate and pull the entire projectile along with it when it skips off the plate. Alternately, if the projectile digs deep enough into the plate, the glancing rotation forces will become countered by plate material peeled from the plate and mounded up in front of the projectile and this mound of material will be thick enough to reverse the glancing rotation and cause the projectile to literally ricochet from the plate back and pass entirely through the plate. Note that the initial impact point and the point where the projectile finally either penetrates or glances off may be very far from one-another as the projectile skids sideways during this see-saw battle of forces. Since the AP cap is squeezed between the nose and the plate, it takes the brunt of these rotation and twisting forces, as well as the compression forces due to the forward motion of the projectile into the plate, so it takes a real beating. With Type 1 projectiles, the minimum decapping plate is so thin that the projectile has rather little change in its forces to decap it. There does seem to be a very slight trend to allow thinner plates to decap the projectile as obliquity increases, but I have only a couple of data points and thus cannot give any idea of how much this change would be. Thus, just as with the minimum Decapping Gap at over 30° obliquity, I am simply going to assume that the minimum thickness does not change out to the maximum obliquity allowed of 80°. With Type 2 projectiles, the plate thickness is appreciable and the strong force under the cap on the impact side that occurs prior to the projectile digging into the plate is applied directly onto the solder joint as a huge twisting force away from the plate. The result is that the minimum decapping plate thickness to knock off the cap drops abruptly, though I have some variation as to how much from the several U.S. Army and U.S. Navy Type 2 projectile tests. Thus, I am again creating a Zone of Mixed Results from the minimum plate thickness that I have data on, which is almost exactly 0.12 caliber at 45° obliquity, and a maximum of 0.1399 caliber (0.14 caliber will be the bottom of the region above it, outside the Zone), where this last number is based on cap breakage, as described below. The 0.1399-caliber decapping plate maximum for the Type 2 Zone of Mixed Results for impacts at and 45° obliquity and the maximum for any intact penetration of the decapping plate by any hard AP cap in this obliquity range, which only one data point exceeds in all my tests, is based on tests with British 5.25" APC projectiles that were scale models of the British 15" APC Mark 17B (the British 40-mm 2-pounder APC projectile was also pretty close to a scale model, too, at least as far as nose, AP cap, and windscreen design) in which all of the projectiles that hit at 50° or more against scale-model ship deck arrays always broke up as they passed through the first plate, which was of this thickness. It is possible that a thinner plate would break up the cap, too, but I have no data, so I am going to use the 0.14-caliber thickness as the thickness where all hard caps, Type 1 or Type 2, break up as they try to penetrate the decapping plate at 45° or more. Above the 0.1699-caliber maximum for the Type 2 projectile 0-44.99° Zone of Mixed Results, the AP caps of all projectiles are knocked off, with soft AP caps and hoods torn apart, but hard caps remaining intact (usually) until a much higher decapping plate thickness is reached. The 0.3499-caliber maximum for intact caps after hitting and penetrating a decapping plate of that thickness comes from several 6" Mark 35 projectile tests at 30° that precisely straddled that value, the lower thickness plates allowing intact caps and the greater thickness plates breaking up the caps. The linear decrease to 0.2499 caliber at 44.99° for intact caps (0.25-caliber plates and/or 45° obliquity means always broken) is an estimate based on more-or-less splitting the difference between the 0.35-caliber value at 30° and the 0.14-caliber value at 45°, as well as the shape of the shattered projectile cap curve (see below) which I assumed the breakage curve would more-or-less parallel. It is just an educated guess to be revised if more data ever comes along. My standard formula for the effective thickness as if it was a single plate, when the homogeneous, ductile plate is actually made up of two or more separate homogeneous, ductile plates riveted, bolted, welded, or otherwise tightly bonded together can be applied to the decapping plate, too. Always assume that the plate is of a single quality, so that no matter what the individual plates are made of (as long as it is an iron alloy), they are considered the same material for this calculation. where "T1" through "TN" is the effective thickness (here the actual thickness) of each of the N laminated plates. In most other cases when computing lamination results, each plate thickness T1 through TN would first have its relative quality compared to World War II U.S. Navy average STS/Class "B" armor multiplied into it to get an effective standard plate thickness for each plate "T1(EFFECT)" through "TN(EFFECT)", then the above computations would be done with those thicknesses, instead of the original T1 through TN values, but for decapping purposes this doesn't seem to be needed. Laminated plates are used in several ships for outer hulls in front of their recessed belts (or with added anti-torpedo "bulges" in front of the belt) and in the especially-designed-for-decapping spaced belt of the Italian World War II VITTORIO VENETO Class battleships, which worked perfectly in that reduced-scale penetration test in 1935. Note that the nominal plate thicknesses for these structures are increased by reinforcing plates at joints and around support ribs and the like so that as much as 15% of the area of these thin outer plates is actually at least 50% or even more thicker than the given values. This is obvious if you look at the waterline outer hull of the IOWA Class battleships and see the rows of rivets where the supports are backing the outer hull plates, making those areas considerably thicker than the single-thickness outer hull between these support regions. Even if the projectile nose only partially overlaps such structures in a hit, the great asymmetric forces caused by the additional resistance on one side of the nose and, of course, AP cap can cause the cap to be knocked off just like the entire plate hit was of this added thickness. This greatly increases the effective thickness of much of the presented area of these outer plates, since the dangerous AP projectiles are so large that they could hit within a half-caliber of one of these reinforcement structures and still have their hoods or caps act like the extra plate thickness extended that much further into the plate's unreinforced surface. Thus, the chance of a hit that can knock off even a Type 2 AP cap is not small in such ship designs. Such things greatly complicate armor evaluations of all sorts, not just decapping effects. The decapping of APC, SAPC, and hooded Common projectiles is rather more complicated than I knew when I wrote my first article on this topic, but the new results given here are logical and approaching about as good as one is likely to get with "real life" in a simulation. This article goes a long way toward making decapping a more realistic property of armored-warship and armored-land-vehicle design. Shatter of a projectile will usually degrade the projectile's ability to detonate full power even if it does succeed in penetrating the plate in a shattered condition. While a major improvement for resisting hull hits where the shell has to go through additional layers of protection, as hits by instantaneously-detonating British APC shells at Jutland [Skagerrak] demonstrated, against turrets and such small exposed spaces, if the shell penetrates in ANY condition, the space is probably going to be knocked out, so decapping MUST cause the projectile to fail to penetrate altogether due to shatter or it is a waste of time, material and money to install it. Another complication is that decapping to improve the resistance of face-hardened armor does indeed give a significant increase in the resistance at low obliquity, but as obliquity increases and glancing effects become more and more important in the plate's resistance, the shatter of the projectile actually makes the resistance from this cause gradually decrease because the glancing of the nose can no longer drag the rest of the projectile with it, so that eventually there is an obliquity value (usually around 45-60°) where the resistance is greater for an unshattered projectile than for a shattered projectile. As a result, decapping is not always the best thing to do to improve resistance if highly oblique hits will be common, as on a curved barbette.